With the effects of climate change becoming increasingly apparent in the past couple of years it is no wonder that people have started finding more radical ways of protecting the trees of the world. No longer are activists settling for small changes in paper usage or half hearted recycling methods, the rate in which our environment is destabilising is rapid and the removal of trees is accelerating the destruction which means that more practical methods are being implemented to save natural landscapes. Interestingly, we’ve stumbled onto an article posted on sojo.net that explores the ways in which Buddhist Monks have ordained trees since the late 1980’s in Northeastern Thailand’s Nan Province in an effort to protect them from increased illegal logging activity. As the practice became more common in Thailand, its impact dulled. However, the practice had already crossed the border into Cambodia. Read the article below to see how these Buddhist monks are saving trees and creating a sense of communal responsibility by connecting their religious beliefs and values to nature. Traveling from several provinces across the heavily logged Cambodian landscape, two dozen Buddhist monks met at a local pagoda last October to attend a workshop held by The Alliance of Religions and Conservation. For Cambodia’s emerging network of “ecology monks” working in an increasingly authoritarian climate, the meeting was a critical and rare opportunity to discuss best practices for local conservation projects. And then two cops showed up and shut it down. Several of the monks were visibly upset, Elkin said. Though traditionally revered in Cambodia’s majority-Buddhist society, monks today are not immune to the government’s crackdown on civil society actors. But where efforts at civic organization meet rebuke, Cambodia has seen the rise of one act of conservation — the holy ordination of trees — which originally emerged in Thailand and has risen in practice under the auspices of the Buddhist faith. The most venerable of the group took the two officers, local cops not antagonistic to the meeting but seemingly following orders, up the hill where the group ordained a tree into the Buddhist faith, and then dispersed. Beginning in the late 1980s, venerable Thai monks began to ordain trees as they would induct a new monk to the faith. Often choosing the oldest and largest trees, which hold domain over the forest, the monks would recite the appropriate scripture, often from the Pali Canon, garb the tree in traditional monk’s robes, and read from sections of Buddhist scripture that coalesce faith, ecology, and conservation. Though the practice varied, it was understood across the board as an effort to alleviate suffering, a core commandment of Buddhist faith. 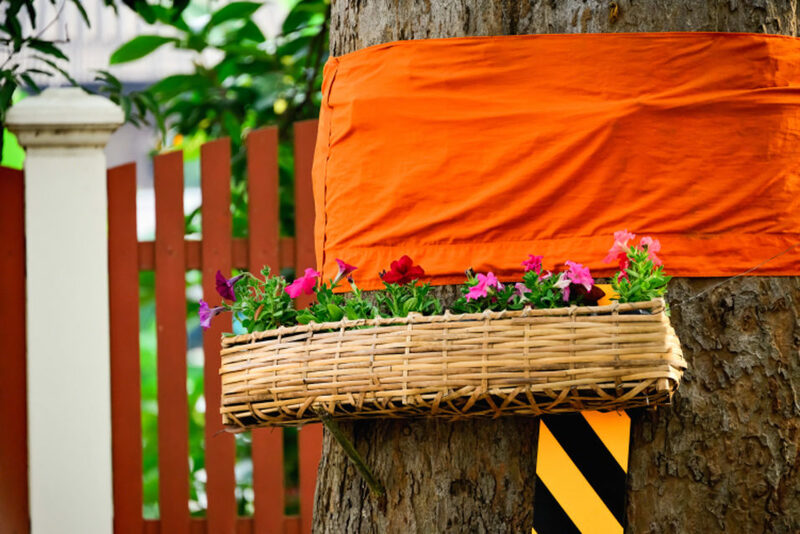 The ordained tree, garbed in orange for a monk or white for a maechi (one of several titles given to women who have dedicated their lives to the Buddhist faith), serves various conservation roles. Most immediately, the human trace left in the forest dissuades illegal loggers. To harm an ordained monk is a religious taboo and legal offense. An ordination extends this sacred status to the tree. Communities that ordain trees often patrol the forest, taking photos of illegal activity and reporting wrongdoers. Buddhist practitioners bear moral authority in society. Many have found the need to adapt that morality to the modern world. Northeastern Thailand’s Nan Province was ground zero for tree ordination ceremonies in the late 1980s and early 1990s, when Thailand saw an uptick in logging and a growing encroachment of farmers on forest lands. Loss of woodland came to a head in 1988, when monsoon rains triggered landslides on a heavily logged mountainside in southern Thailand’s Nakhon Si Thammarat Province, killing hundreds and devastating towns. In 1996, an NGO in northern Thailand announced plans to ordain 50 million trees in honor of the 50th year of the reign of Thai monarch King Bhumibol Adulyadej. “That kind of marked a shift, because it really showed how effective these things were. And so, the state began to co-op [the practice]” said Dr. Susan Darlington, a professor of anthropology and Asian studies at Hampshire college and author of The Ordination of a Tree. By 2010, contestants for Miss Thailand Universe were performing tree ordinations in northeast Thailand as part of the pageant. As the practice became more common in Thailand, its impact dulled. However, the practice had already crossed the border into Cambodia. Elkin says she saw tree ordinations become common practice in northwestern Cambodia after Venerable Bun Saluth, the head of the Samrong Pagoda in Oddar Meanchey Province, took the practice back home in 2002, after five years of studying with ecology monks in northeastern Thailand. Both Thailand and Cambodia’s Buddhist Sangha institutions are heavily influenced by the government but remain fertile grounds for voices of dissent and conversations about conservation. The official religion of Thailand and Cambodia is Theravada Buddhism and more than 90 percent of the population in both countries identify as Buddhist. Theodore Mayer with The International Network of Engaged Buddhists, said that Buddhist practitioners bear moral authority in society. Many have found the need to adapt that morality to the modern world. Phra Paisal Visalo, the renowned abbot of Wat Pa Sukato, contends that it’s the duty of all monks to care for the environment, and while he has seen less ordinations or less high-publicity ordinations, recently, an entire body of conservation work has developed since the ordinations began. In the Nan Province of Thailand, where Darlington does her research, corporations target farmers in predatory loan programs that incentivize growing corn, but buy it back below market cost. Deforestation results as farmers hustle to remake their investment. Tree ordinations as community events encourage farmers to avoid the cash crop loan program and turn to community-based solutions for deforestation. Of Thailand’s neighboring countries, Cambodia has taken most quickly to tree ordination ceremonies. The authoritarian country’s forested northwest is heavily logged, often illegally, and locals have little recourse and high risk.